About seven inches long. Blue head, neck, back, rump and tail. Reddish brown, throat, breast and flanks. Grayish blue belly. Black beak and eyes. 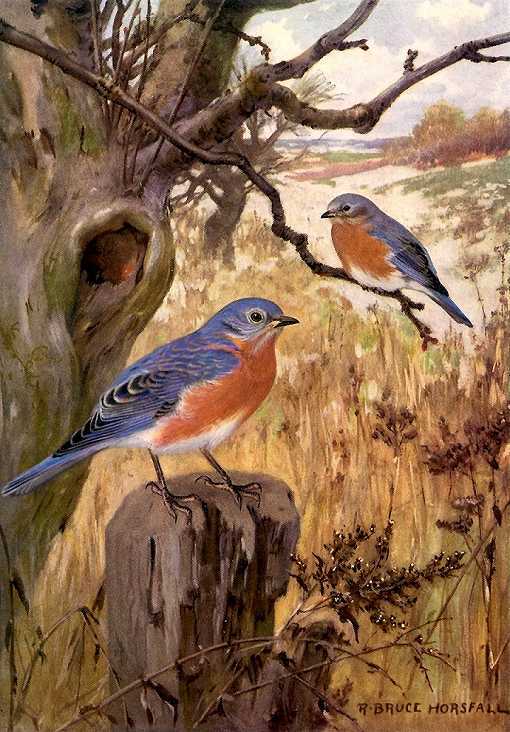 Eastern Bluebirds inhabit forest edges, groves and small tree stands in open country, farms and towns. Installing “bluebird trails”, groups or lines of a number of bluebird houses, maintaining them and monitoring their bluebird inhabitants is a popular hobby. Their breeding range extends throughout eastern North America from the Great Plains to the Atlantic Coast north to Saskatchewan, New Brunswick and Nova Scotia south to Mexico and the southwestern U.S. in southern New Mexico and Arizona. Migrates to the southern states and Mexico in winter. Bluebirds are known for their display of affection. 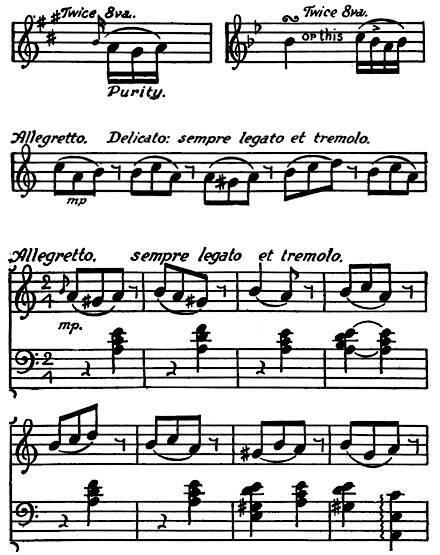 The male perpetually seeks the company of the female, courting her with his pretty love songs, feeding her insects and chasing rivals from their domain. They dart after beetles, spiders, caterpillars and grasshoppers from their perches on fences or low trees where they spot insects on the ground. In the autumn they eat berries and other odd fruit. Habitat loss and competition with non-native English Sparrows and Starlings caused declines in their population until their appeal inspired widespread interest in bluebird nest boxes. Their rebound is a good example of successful intervention. They build scanty nests of grass and feathers in natural or abandoned tree and post hollows, cliff crevices, barns and other building nooks and crannies, mail boxes, and many in bird houses placed specifically for this favorite of birds. Females lay four to six bluish white eggs which hatch after about two weeks incubation and young leave the nest in about another three weeks. Usually raise two broods in a season. The Eastern Bluebird Birdhouse has a 4″ by 4″ floor, 9″ inside floor to ceiling, 1 1/2″ diameter entrance hole located 7″ above the floor and ventilation openings through the floor and under the roof. A hinged roof can be secured in closed position with shutter hooks, or some may prefer a fixed roof with a Side Opening Door which may be more convenient. Use wood stock rough cut on both sides. Tree swallow nest boxes placed between bluebird nest boxes invite these good neighbors and they will help defend against sparrows. The Swallow Birdhouse is similar and could easily be mixed in with any bluebird trail. It has a 5″ by 5″ floor, 8″ inside floor to ceiling and a 1 1/2″ diameter entrance hole located 6″ above the floor. You may consider using the larger Mountain Bluebird Birdhouse (same as for the western bluebird), which will accommodate both bluebirds, in areas where the mountain and eastern bluebird ranges overlap, in the western portions of the Dakotas and the border area between southern Manitoba and Saskatchewan. It has a 5″ by 5″ floor, 12″ inside floor to ceiling and a 1 9/16″ diameter entrance hole located 10″ above the floor. Also consider using this slightly larger Yellow-bellied Sapsucker Birdhouse in the Great Lakes and northeastern US where the breeding ranges of eastern bluebird and yellow-bellied sapsuckers overlap. Measurements are 5″ by 5″ inside square base, 12″ floor to ceiling and a 1 1/2″ inch entrance hole located 10″ above the floor. Always assemble with corrosion resistant screws fitted to pre-drilled countersunk pilot holes. Mount bluebird houses 3 to 6 feet high on posts in woodland clearings, shelter belt edges bordering fields, among scattered trees, or pasture fence lines. Make a “bluebird trail” of several houses about 100 yards apart; further in wide open expanses and closer in clearings of wooded areas. On fence lines mount houses on the sides of posts facing the next post. The recessed position helps avoid cattle or other large animals that like to rub against them. Monitor the boxes for unwanted squatters. Deter predators with steel posts or sheet metal wrapped around wood posts. Avoid shade, but also avoid direct sunlight through the entrance if possible. Flycatchers, chickadees, titmice, nuthatches and woodpeckers may also use these boxes. A hinged roof can be secured in closed position with shutter hooks, or some may prefer a fixed roof with a Side Opening Door which may be more convenient. Use wood stock rough cut on both sides. It has a 5″ by 5″ floor, 9″ inside floor to ceiling and a 1 9/16″ diameter entrance hole located 7″ above the floor. 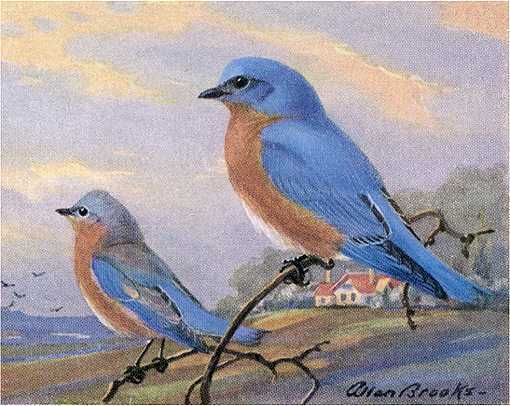 Mount bluebird houses 3 to 6 feet high on a post in woodland clearings, shelter belt edges bordering fields, among scattered trees, or pasture fence lines.